While on the topic of locating yourself using sound, I’d be remiss if I didn’t point to Freesound, the fantastic community sound library (currently pushing some 17,000+ Creative Commons-licensed samples). If you’re not yet familar with Freesound, you can broadcast your recordings to the planet, free for use in music worldwide, and pull recordings without attracting the attention of intellectual property lawyers. Rather than dig through samples by abstract categories, you can use Freesound’s geotags to pull the exact ambience of certain parts of the world. It gives you the power to soak up the vibe of the beach at Playa del Medio without having to actually suffer through . . . erm . . . being at the beach. Okay, bad example. But while there’s the expected bias toward the U.S. and Europe, field recordings are slowly finding their way from other corners of the globe, too. 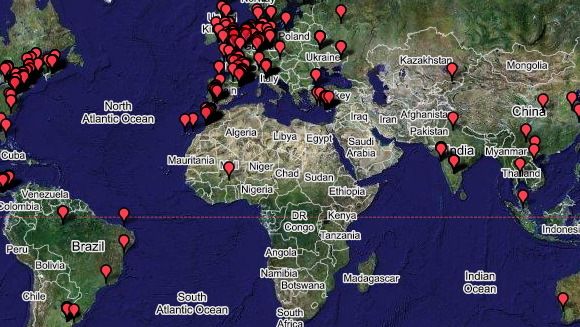 Aside from samples, it’s not hard to imagine geotags being used to help find musical collaborators near you . . . especially as latency increases over longer distances.